PRESS RELEASE – A series of events will be held on December 7, 2014 to commemorate the 73rd Anniversary of the Attack on Pearl Harbor.Listings are below. December 6th – 8th Anniversary Dinner Gala: “Destination & Dreams,” 6:30 to 10:30pm at Pacific Aviation Museum Pearl Harbor. A fundraiser for the Museum. 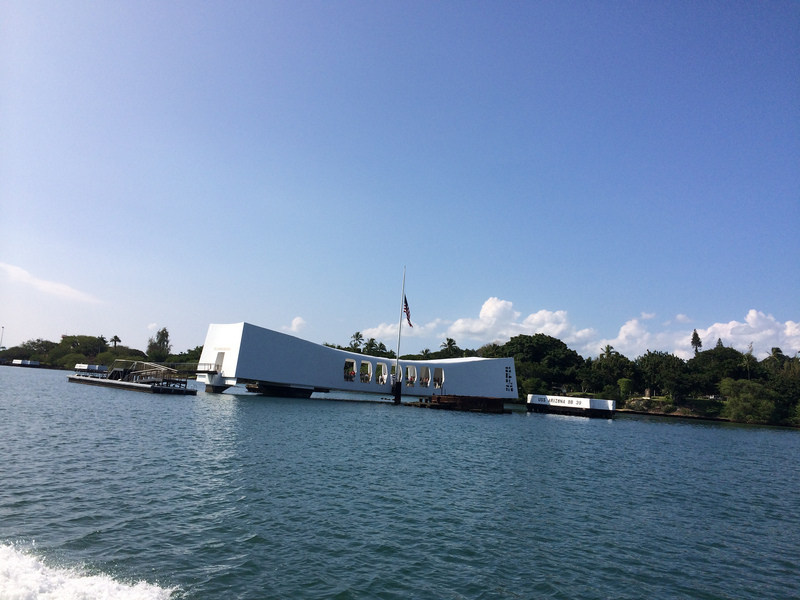 USS Arizona Ceremony, 7:45am, Pearl Harbor Visitor Center, free admission. Attendees should arrive at World War II Valor in the Pacific National Monument by 6:30am at the latest. The theme of this year’s historic commemoration, “Preserving the Memory” focuses on how we keep the story of the attack on Oahu and WWII alive for the nation and the world. Parking is available but limited at Pearl Harbor Visitor Center. Visit www.PacificHistoricParks.org for more information. Blackened Canteen Ceremony, 11:30am, aboard USS Arizona Memorial. Public must arrive by 11am. Dr. Hiroya Sugano M.D., Director General of the Zero Fighter Admirers Club, will honor fallen Japanese and American soldiers with this ceremony, held annually since 1945. Two Army Air Force B-29s collided and crashed during a bombing raid over Shizuoka, Japan in June 1945. The event killed 23 Americans and over 2,000 Japanese. The canteen was pulled from the wreckage–the same canteen Dr. Sugano uses to pour whiskey into the waters of Pearl Harbor as a symbol of peace, honor, and reconciliation. Kenneth DeHoff, executive director of Pacific Aviation Museum Pearl Harbor and George Nottingham, WWII B-29 pilot will participate with Dr. Sugano in this commemoration ceremony. Following the ceremony students from Nagaoka, Japan will meet with Pacific Aviation Museum Pear Harbor Executive Director Ken DeHoff and Dr. Sugano for a roundtable discussion at the Museum. The Japanese students, accompanied by a Nagaoka City representative, are participating in an educational and cultural exchange between Nagaoka City and Honolulu. 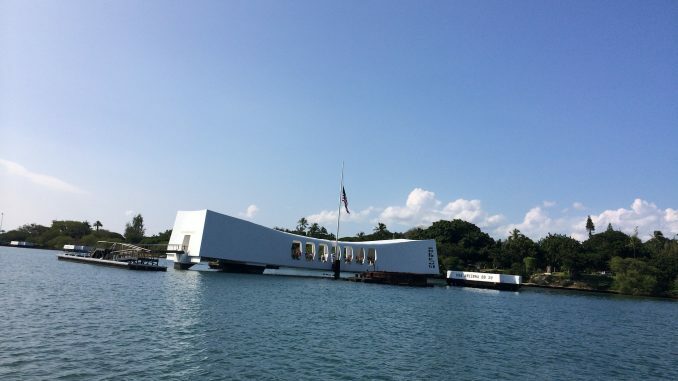 December 7th – Pearl Harbor Memorial Parade, 5:00pm. Parade begins at U.S. Army Museum of Hawai’i at Fort DeRussy in Waikiki, travels down Kalakaua Avenue, ending at Kapiolani Park. See the Museum’s F-104 Starfighter in the parade, meet Museum aviators, and receive free aviation gifts as they parade through Waikiki. The Museum Store and Laniakea Café restaurant are unique in their offerings and their 1940s ambiance. Laniakea Café will be open from 9am-4pm. Located in the air-conditioned Hangar 37. Breakfast, lunch, snacks, and beer and wine are available. Phone (808) 441-1000 or visit www.PacificAviationMuseum.org for tickets to the Museum and more information. Tickets and a free Flight Simulator coupon are available online. Pacific Aviation Museum Pearl Harbor is a 501(c) (3) nonprofit organization, which depends on membership and donations for its support. 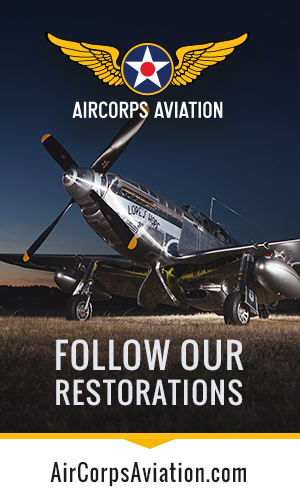 A Smithsonian Affiliate, it is also rated one of the top 10 aviation attractions nationally by TripAdvisor®. Located at 319 Lexington Boulevard, Historic Ford Island, Pearl Harbor, Oahu, Honolulu, Hawaii 96818. Good morning, Thank you for this information, it is wonderful. As we are coming from the main land (my daughter is marching in the parade), I was just wondering if you knew the channel that this will be on? I would like to be able to see if they do live feeds, so that my family here is able to see our daughter march. Today, Seaman Earl Leroy Morrison of the USS Arizona lies in Section Q, Grave 1147 in the Punchbowl underneath a marker that names him as “Unknown”. Seaman Morrison is an example of the dysfunction of the Joint POW/MIA Accounting Command (JPAC) in identifying and returning American heroes to their families. Investigators at JPAC have been pleading with the inept JPAC command and leadership for Seaman Morrison’s identification for years without result. A lengthy list of scandals regarding the Joint POW/MIA Accounting Command (JPAC) has now been publically exposed by NBC, CBS, NPR, Stars and Stripes, the Associated Press, and a host of other media investigative reports. Scathing official reports by multiple federal agencies painted efforts by JPAC as dysfunctional, duplicative, inefficient, wasteful and so poorly managed and led that JPAC simply could not do the job assigned to it. No matter how hard the JPAC Central Identification Laboratory (CIL) and JPAC management tried to spin the fact that only 385 identifications in seven years with an annual budget far exceeding $100 million was someone else’s fault, the American public and Congress refused to buy this hogwash. The JPAC CIL finally admitted that it takes them an average of ELEVEN YEARS to make an identification after remains are recovered. Investigations by the Department of Defense found 600 to 1,000 sets of American servicemen’s remains in cardboard boxes in the JPAC Laboratory that the CIL is incapable of identifying because their methods are antiquated and obsolete. The American public and families of MIAs who accepted the smoke and mirrors from the JPAC public relations machine for years through fraud, phony “arrival home” ceremonies, and out right lies; feel angry, humiliated, and betrayed beyond belief. A large number of current and former employees of JPAC cooperated with these investigations because they are dismayed, disillusioned, disheartened, disgusted, and still disbelieving of what they experienced at JPAC. The Chairman of the Joint Chiefs of Staff, General Martin Dempsey, in congressional testimony, spoke for many of them when he called JPAC “disgraceful”. Despite being accused of being “vindictive and “disgruntled”, many past and present employees braved severe retaliation by the JPAC management to come forward with the truth. There are many truly dedicated men and women who work at JPAC in non-management roles who believe in the mission. Researchers, military recovery specialists, and field investigators who hack through jungles, climb mountains, and wade rivers only to be sabotaged in their work by a completely dysfunctional command deserve great credit for their efforts to expose JPAC’s corrupt operation. In the final analysis, no one with any common sense whatsoever believed the excuses of the JPAC Laboratory Scientific Director and other members of the leadership clique at JPAC when their disgraceful actions became public. The Secretary of Defense finally ordered JPAC dissolved and the entire operation be “overhauled”. The changes are long overdue. The JPAC Scientific Director has now announced his ouster. Yet, there are many more in the JPAC command hierarchy who continue to make excuses and are trying to keep their high paying jobs through their usual finger pointing, denials of responsibility, and boasts that they can “overhaul” their own severe dysfunction. These people learned these techniques from the JPAC Scientific Director and are intent on perpetuating the usual JPAC organizational culture of obstruction, retaliation, and a “it can’t be done” attitude. They cannot be allowed to stay and infect the new organization being formed to replace JPAC and its equally dysfunctional sister, the Defense Prisoner of War/Missing Personnel Office (DPMO). It is now incumbent upon the Secretary of Defense to ensure that his pledge to the American public for a “paradigm shift” away from “outdated, institutionalized thinking” at JPAC becomes a reality. Such needed massive reform cannot be accomplished by changing the names of the organizations, removing just a few individuals, re-shuffling the same poor managers to new desks and titles in a brand new $70 million dollar building at Hickam, and allowing those who have supported the complacent attitude of not keeping up with modern science such as DNA, to keep their jobs. To do so would only allow the same infectious disease of arrogance and lies to the families of American heroes to take root all over again. The disaster at JPAC has been added to the VA Hospital, Dover Mortuary, Arlington Cemetery, and the Viet Nam Unknown debacles. Everyone at any level of management and culpability in the many JPAC scandals must be removed to insure that the organizational dysfunction at JPAC is finally ended…forever. Only then will Seaman Morrison receive the honor of having his name restored to the marker above his grave.